While some aquarium plants can be planted in the gravel at the bottom of your aquarium, placing your plants in pots instead has several advantages. You can move potted plants around, making it easy to redecorate or to clean. If your fish decide to eat a plant or it dies for some other reason, it's a simple matter to replace a plant in a pot without disturbing its neighbors. Soak potting soil in water. The soil should be the consistency of mud pies. Fill your pot with the soil. Tamp down to remove any air bubbles. Make a well in the center of the pot with your fingers. The well should extend almost to the bottom of the pot. Set the plant in the pot, being careful to let the roots hang down straight beneath the plant. Hold the plant with the crown of the plant above the level of the soil and carefully fill in around the roots with wet potting soil. Cover the top of the soil with gravel. Press down lightly on the gravel to afix it to the wet soil. Lower the plant slowly in a sink full of water until it's submerged. This will evacuate any air bubbles that might have worked their way into the pot while you were adding soil. 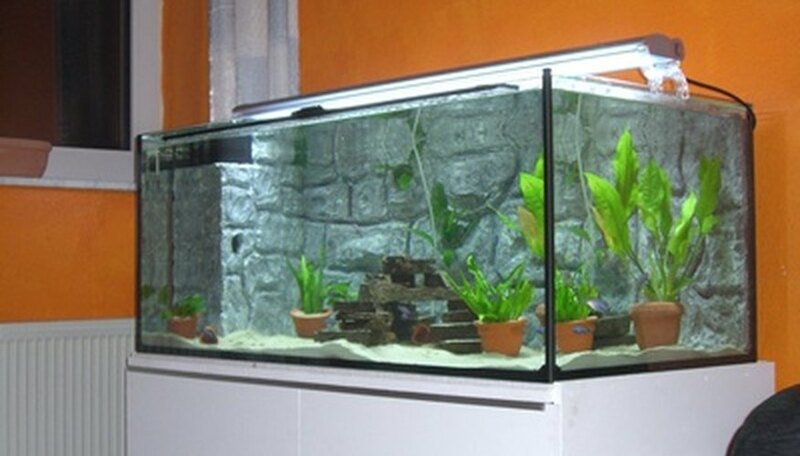 Remove the plant from the sink and place in the desired location in your aquarium. Choose plastic or clay pots. You can even use recycled yogurt containers or plastic caps off aerosol cans, as long as the pot is large enough to contain the plant's roots.